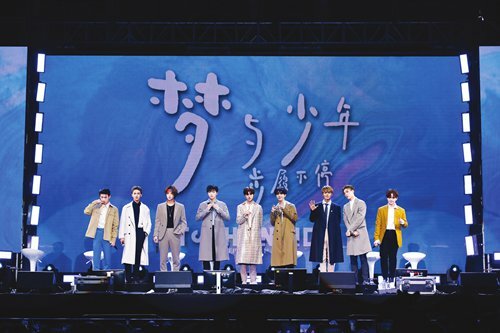 A Chinese boy band Nine Percent, which teamed up with nine winners in a Chinese reality boy band group survival show, Idol Producer, recently released their debut album To The Nines. The members appeared at a press conference for the new album in Beijing on November 12. To start the press conference, Nine Percent performed the album's lead single Creator. It is a song with infectious, lively rhythm and lyrics that express the determination of the members to remain surpassing themselves in the future. Following the show, each of the nine members shared personal feelings and experiences they had during the creation of the album. Mainly produced by Tencent Music Entertainment Group (TME), the presale album is already available on QQ Music, Kugou Music and Kuwo Music. Music fans can enjoy all of the songs in their new album on these three platforms in a few days.